Terminator Genisys - Vicious family circle with a plot similar to recent X-Men movie of time travel back and forth, this movie has entertainment at dearth. A run and chase through out, with all possible terminator models till now at display and action, this science fiction story turns into that of a faction; with technology in fashion and dominating/defeating logic and passion. 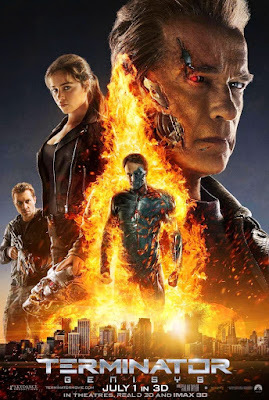 Probably the Terminator franchise makers thought of terminating the series with Arnold, synonymous with the term 'Terminator', playing the major role unlike in fourth part and so, 'He is back'... and stays at the end as an 'upgraded' model. Though the end credits give a hint of a possible sequel again, concluding this series for now without similar repeats would be a gain... for both the makers and takers (audience), so that it ends at fifth and not as filth.